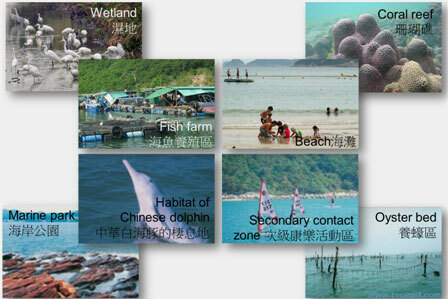 Sensitive receivers in Hong Kong’s coastal waters. Tolo Harbouris a semi-enclosed harbour with a poor flushing capacity (average current speed: 0.02 – 0.03 m/s). Pollutants in the harbour take about one month to be flushed away. The rapidly expanding new towns in Hong Kong, Sha Tin and Ma On Shan,are located on the south shore of the harbour, while Tai Po is on the East Shore. 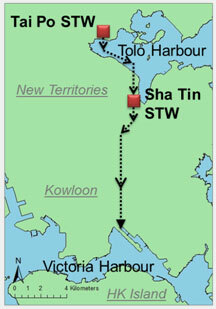 Before the Tolo Harbour Effluent Export Scheme (THEES), the effluent from two major secondary sewage treatment works (STW) (Tai Po STW and Sha Tin STW) was discharged into the harbour. Although the sewage was biological treated to remove nutrients, the nutrient level in the harbour remained very high and red tide was a serious problem. 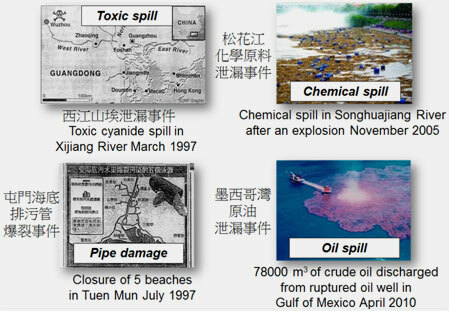 In particular, the red tide occurrences in 1988 were about 30 times, accounting for 1/3 of the total occurrences in Hong Kong. To avoid the environmental impacts induced by the effluent from Sha Tin and Tai Po STWs, THEES has been designed to divert the effluent to Kai TakNullah flowing into the betterflushed Victoria Harbour. Since the fully implementation in 1998, there has been remarkable reduction in total inorganic nitrogen (TIN) levels and the chlorophyll-a level met the water quality objective in the past 10 years. Additionally, annual red tide occurrences in ToloHarbourhave been reduced to less than five in recent years. The Kai Tak Nullah is a primary drainage channel to collect storm water in the East Kowloon area and the effluent under the ToloHarbour Effluent Export Scheme (THEES).The existing Kai Tak Nullah is about 2.4 km in length. It flows from Po Kong Village Road along Choi Hung Road, pass Tung Tau Estate and San Po Kong, into Kai Tak Development Area before discharging into the Victoria Harbour. The nullah is one of the major flood relief drainage channels in East Kowloon area.A project entitled “Kai Tak River” has been proposed to turn the Kai TakNullah into to an attractive green river corridor in urban areas. The river will provide space for leisure and public activities serving the community whilemeeting the needs for flood protection and traffic improvement. Figure 5. ToloHarbour Effluent Export Scheme. Figure 4. 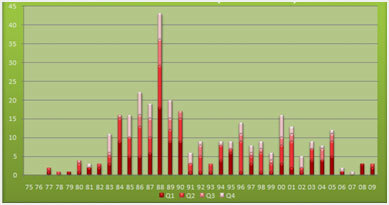 Annual red tide occurrences in ToloHarbour. Harbour Area Treatment Scheme (HATS) represents a major environmental infrastructure in Hong Kongthat collects the sewage from the densely populated urban areas on both sides of VictoriaHarbourtoa centralized sewage treatment works at Stonecutters Island (SCISTW). Based on the EIA studies on four siting options, the centralized sewage submarine outfall at Stonecutters Island can best minimize the environmental impacts induced by sewage and sludge discharge on both sides of the harbour. 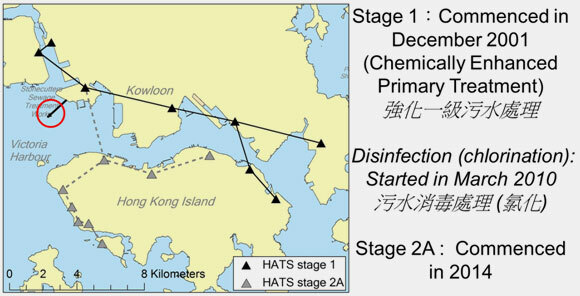 There are two stages of HATS:Stage 1 is designed to collect the preliminarily treated sewage in Kowloon for furthertreatment at SCISTW. Since the commissioning of Stage 1 in December 2001, an overall improvement of harbour water quality is observed: an average increase of dissolved oxygen by about 10%; an average reduction of ammonia by about 25%; an average reduction of E. coli by about 50%. Whilst the remarkable improvement of overall water quality in the harbour, the western harbour (especially the area of Tsuen Wan beaches) is affected by the large volume (1.4 million m3/d) of chemically enhanced primary treated (CEPT) sewage discharged from the SCISTW. Seven beaches in Tsuen Wan district have been closed due to excessive E. coli level since 2003.After the implementation of Stage 2A in 2014 which collects the remaining untreated sewage fromHong Kong Island, the discharged sewage isapproximately2.4 million m3/d.To minimize the environmental impacts induced by such a large volume of partially treated sewage, disinfection units with chlorination have been in operation since March 2010. It is noticeable that the water quality in Tsuen Wan beaches is improved and meets the water quality objectives. Four beaches (Lido, Casam, Approach and Hoi Mei Wan) are decided to re-open on 15 June 2011. 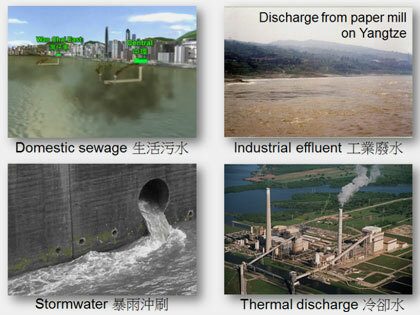 In Stage 2B, the sewage treatment level is upgraded to secondary biological treatment to further reduce organic matter for minimization of environmental impacts. Figure 6.Harbour Area Treatment Scheme (HATS). Worldwide, there are three common disinfection approaches: chlorination, ozonation, and ultraviolet (UV). Among the three, chlorination is the most cost-effective with low capital and operation cost. By oxidation of cellular material, chlorination can reduce the levels of a wide range of microorganisms by 99%. Advantages of this well-developed disinfection technique also include the relatively high reliability and low maintenance. Despite of the effectiveness of chlorination, there are some environmental impacted from chlorination. Chlorine residuals, even at a low concentration, is highly toxic to fish and other aquatic life. During the chlorination process, hazardous compounds (e.g., trihalomethanes“THMs”) are formed. These chlorination byproductsare carcinogenic to humans.Hence, optimization of chlorine dosage becomes a crucial topic to mitigate the environmental impacts induced by the disinfection (chlorine) operation.